In the modern corporate world, the line between right and wrong is not always readily apparent and leaders are forced to make tough decisions on a regular basis. To bring awareness to these issues, the junior class of Networks, Gongaware and Presidential scholars at Indiana State University welcomed more than 400 students, educators and industry professionals to campus for the fourth annual Ethics and Corporate Social Responsibility Conference. Monday's (March 30) event featured three keynote speakers: Todd Rokita, Indiana secretary of state; Howard Learner, president and executive director of the Environmental Law and Policy Center; and Jim Morris, president of Pacers Sports and Entertainment. 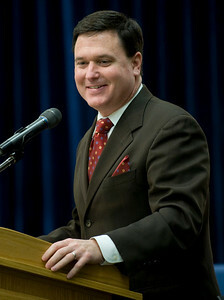 Rokita described the role of his office as the "intersection of law and business and government." That intersection creates a need for ethical decision making, he said. "One of the best tools for promoting ethical decision making is to expose whoever or whatever it is to the digital light of day," Rokita said, noting that his office has been working to make many public documents available online. "Our approach has been transparency." Rokita spoke directly to the students in the audience and reminded them that they will be entering a global market with competition from around the world. Though ethics is not the same in all cultures, it is imperative to success, he said. "We need leaders. You are leaders and you are our best ethical hope," Rokita said. Learner spoke of a "moral and ethical obligation to save the planet" during his remarks on the movement toward a green economy. "How we can we afford to waste energy and waste money by paying for energy that we could conserve by being more efficient?" he asked audience members. Learner discussed simple ways to conserve energy, like switching to compact fluorescent light bulbs in homes and businesses. That step alone can reduce electricity use by 10 to 15 percent, he said. Other measures, like wind energy and a high speed rail network, will take more time. "Wind power is the fastest growing energy source in the U.S. and the world," he said. The Midwest is well positioned to take advantage of both wind power and a high speed rail network to link its major cities, offering an alternative to automobile or air transportation, he noted. Learner said technology is one key to unlocking a greener world. He held up a cell phone and reminded audience members that a small device capable of so much was unthinkable just a few years ago. He said similar innovations aimed at helping the environment are on the horizon. "The pace of technological innovation is huge," he said. "Hold on, we're ready for one exciting ride when it comes to clean technology." Morris has dealt with ethical dilemmas throughout his extensive career. Before joining the Pacers, Morris served as executive director for the United Nations World Food Programme. He has also held leadership roles with the Lilly Endowment, IWC Resource Corporation and Indianapolis Water Company. "Leadership is about seeing your opportunity in its largest possible context," Morris said. Often asked what prepared him to help lead the Pacers, Morris said the decision came down the principle of community. "The Indiana Pacers is a community building asset, it's a unifying factor," he said. Morris took over as president for the Pacers in 2007 after a tumultuous time during which some players had been "misbehaving." That bad behavior threatened to tarnish the reputation of the team. Morris seized an opportunity to help rebuild the team with which he has special ties. A Terre Haute native, Morris served on the Indiana State Board of Trustees during the 1970s when Larry Bird led the Sycamore men's basketball team to the national championship game. Bird is now president of basketball operations for the Pacers. "There's just no substitute for doing it right and doing it in a way Hoosiers would be proud of," Morris said. In addition to the three keynote speakers, the conference featured concurrent sessions throughout the day on a wide range of topics with discussions led by industry professionals and faculty members. The conference kicked off the college's Ethics Week, with activities continuing through Friday (April 4). The annual conference is planned by the junior members of the Networks Professional Development Program, which is part of Networks Financial Institute at Indiana State. Juniors Kristin Elston and Stephanie Balbach served as executive co-directors for the event. "Though there were challenges during the planning and executing stages, I had the opportunity to sharpen my leadership, organizational and communication skills. I gained so much from this experience and know that it will be carried forward long after graduation," Balbach, an insurance and risk management major from Evansville, said. Networks Financial Institute was founded in 2003 with a grant from Lilly Endowment, NFI strives to facilitate broad, collaborative thinking, dialogue and progress in the evolving financial services marketplace, concentrating on the areas of education, outreach and research. Headquartered in Indianapolis with offices in Washington, D.C. and on the campus of Indiana State, and with outreach internationally, NFI's goal is to serve as a catalyst for change in the financial services industry. For more information about Networks Financial Institute, visit www.networksfinancialinstitute.org. More than 400 students, educators and industry professionals gathered at ISU for the Ethics and Corporate Social Responsibility Conference.